Briana Byrne is an Assistant Engineer providing traffic engineering support on projects ranging from traffic impact analysis to Complete Street corridor projects. Briana Byrne graduated from California Polytechnic State University, San Luis Obispo in 2014 with a major in Civil Engineering and focus in Transportation Engineering. During her last year at Cal Poly, she interned with the County of San Luis Obispo Public Works Department. She is interested in multimodal transportation and the impacts a great transportation system has on the community as well as the individual. Growing up, she first experienced the euphoria of freedom by riding buses and BART all over the East Bay and San Francisco. Then in San Luis Obispo, the existing bicycle infrastructure encouraged her to start cycling and not soon after become her main means of transportation. She would like to help communities embrace and emphasize multimodal transportation improvements where none exist or they are lacking. 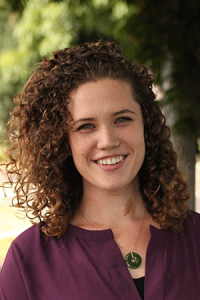 She was involved with ITE at Cal Poly, and in 2013-2014 she served as a committee member for the planning of the inaugural ITE Student Leadership Summit hosted by the Cal Poly ITE Student Chapter; the Summit has since established itself as an annual student-organized event in the Western District. She is also a member of Young Professionals in Transportation.